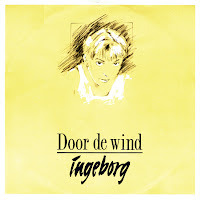 In the 1989 edition of the Eurovision Song Contest, Belgium was represented by Ingeborg Sergeant and the song 'Door de wind' ('Through the wind'). The song was written by Stef Bos, who also performed backing vocals on the track. Unfortunately, it wasn't a big success for Belgium: the song ended up on 19th place in the Contest. The single features the normal and acoustic version of 'Door de wind'. It's a charming little song, but probably not Song Contest material.